The customer service, portable stage products and after sales service is 5 star. We put everything possible forward to the test with this product, and it out-performed most. Portable Stage have been around for a long while, and it shows, the knowledge they have about Portable Staging is very high. They are constantly improving staging products and features with the end user in mind. 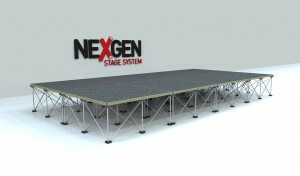 The NexGen product and next generation deck platforms are innovative, and they have now taken the step of discontinuing their 2x1m platforms has they feel it is not necessary to use this size given the advantages of their “No Locks” 1x1m system. The 1x1m stage platform modules are priced to almost match the larger ones, making them easier to store and very easy to manage, when assembling. Offers a 1 year failure guarantee, with 5 year warranty guarantee. Manufactures products to ISO British Standard Quality standards. Also offers 1x520mm modules for choir type configurations. They have a “Portable Staging Visual Quote Builder Tool” online, which shows the stage you are likely to get whilst building a quote request. Definitely the best staging. Ive used Revostage, intellistage and Portable Stage. The others do the job, but the Portable Stage products and service is better. I went for these because you have to order the 2x1m sized ones from the other brands to get a similar price. We needed a choir configuration, the customer services is so helpful. Id highly recommend calling this company, and chatting through your requirements, as they are very knowledgeable and seem to know exactly what you need. Saved us a lot of money in the end by suggesting a configuration we hadnt even thought of. Suggestions were about my needs not their sales.